I keep thinking, "Oh, I should do that," as I pass by the exit for the Trail Through Time. It may just be that these lower level areas of Colorado don't hold so much pull for me, but I have actually turned off the interstate at this very exit to take a hike before. Maybe it just feels a little more "built up" than my usual. Today that is changing. Happily, it is not near the 104°F it was when I last hiked the area. 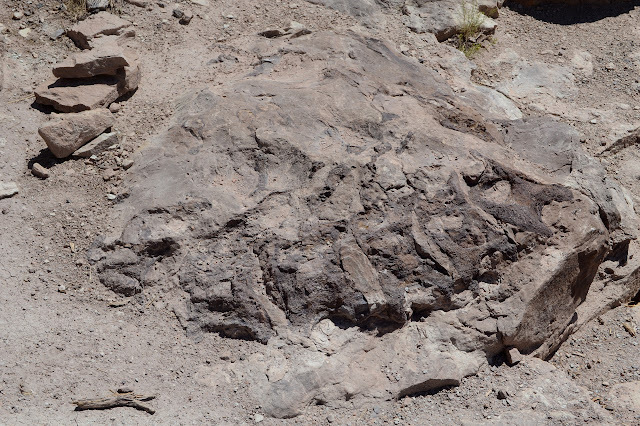 Today I will stop by to see the bones. A set of information signs to start off the trail. 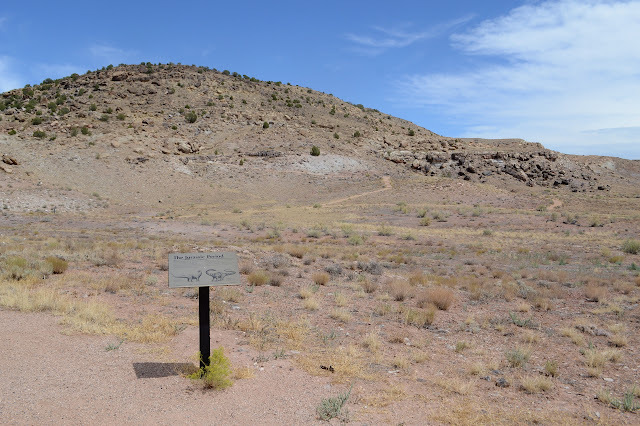 One illustrates the general area of the McInnis Canyons National Conservation Area and one maps out the trail ahead. The walk into the loop along the road that services the dinosaur bone quarry area is a bit uninspiring, it must be said. 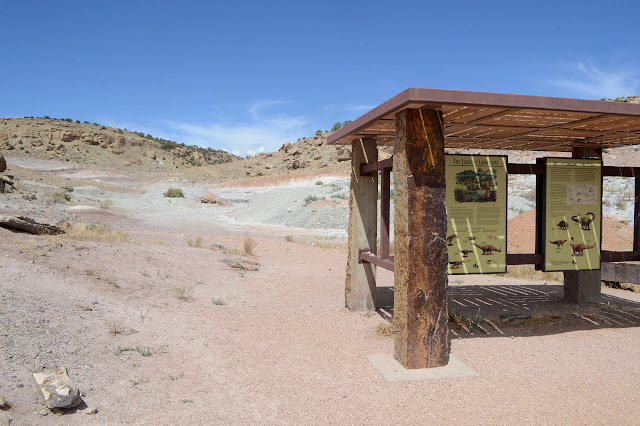 Interpretive signs start up quickly with background information about the Jurassic Period and such things that are relevant to the dinosaurs found in this area. Rather than the traditional numbers, they are hardy metal signs so aren't likely to be lost too soon nor are you dependent on a brochure happening to be available. One of those interpretive signs with the loop trail in the background. Nothing going on or even set up in the quarry area today. 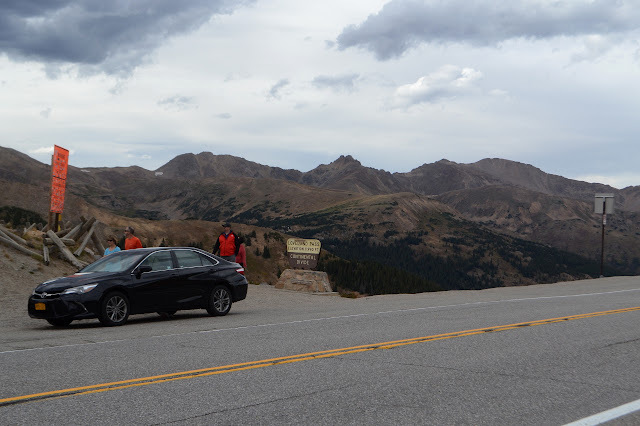 I may have claimed a few hours before that I would not get to go up any peaks in the Rockies, but there was an accident ahead blocking the tunnel on I-70 and the four lanes that feed the two lanes were turning into a parking lot. I decided to show that I could read and take the alternate route suggested. I wasn't sure I was in good company after watching someone take the sharp corner to exit via the entrance, but so it goes. Once at 10 feet short of 12k on the Continental Divide, it was too much to pass up the chance for an evening stroll. Parking is marked 7AM to 7PM, at least on some of the signs, but I suspect no one will bug me while it is still light. The peaks to the east look quite impressive. (They should. There are a couple 14k peaks over there.) The peaks to the west look a little closer at hand so better with only a couple hours to dark. Loveland Pass got a little crowded with the other folks who could not pass up stopping, but the accident must have cleared up quickly as there were not many. 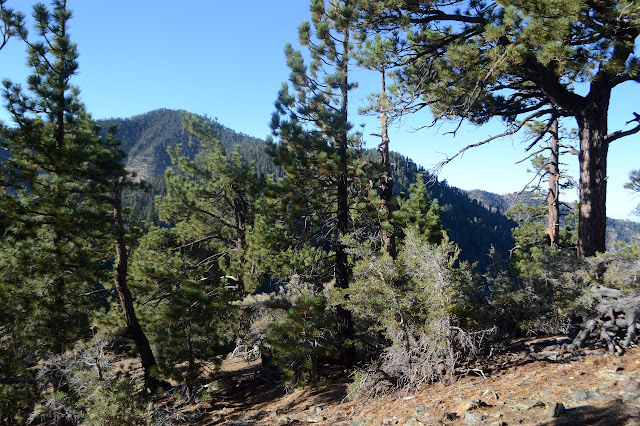 There are no signs regarding hiking in the area, but the first few peaks are well trod. Obviously it is a done thing. It does look slightly official right at the start, but I turn to follow the huge track along the ridges instead. I may not need to go anywhere to get a view, the treeline is below the start, but I am going up anyway. Up! And feeling like I might have gained 10k feet today, mostly in the last couple hours. Passing above what looks rather like an official trail. The distant road is US-6 which I just came up. My turn just serves to add a little up and down to my trek as it rejoins the other trail on the far side of the first bump. Still, I can see a big track leading up a more distant, higher bump, so onward to the real up. Up! Up! Edging around some bump off to the left and climbing to a higher saddle first. Not too much vegetation up here, but some of it is flowering. There the trail goes up to the higher saddle. As I dropped down off the mountains and into Denver, there was just one brief look out over what I knew was there, an infinite seeming plane of grass known as the Great Plains. It was nice to finally find hills again in the west of Iowa. On the way back through, I took a turn for something tucked into those hills: a lake. 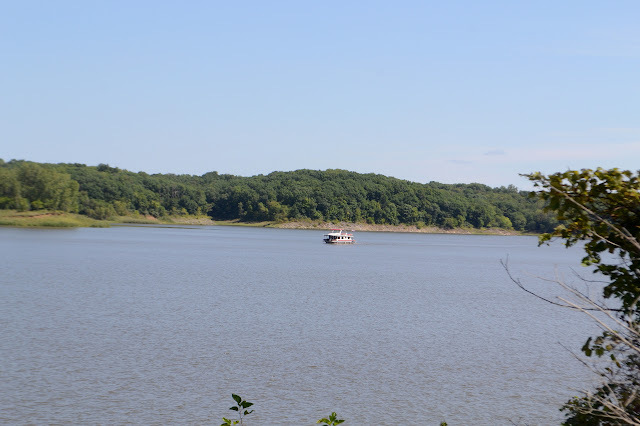 This particular one is actually a dammed bit of the Iowa River. It has a few clusters of trails and I ended up at the Woodpecker system, a loop with a couple trails across that allow the short loop to become even smaller. 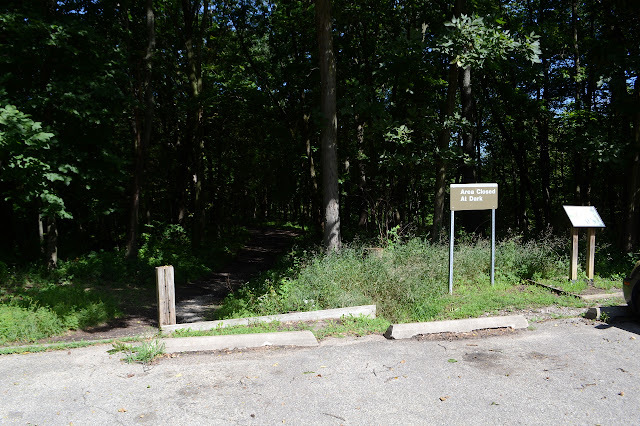 A trail segment across a bridge connects it with the Squire Point system, of similar size, and both are shown on the map at the trailhead. 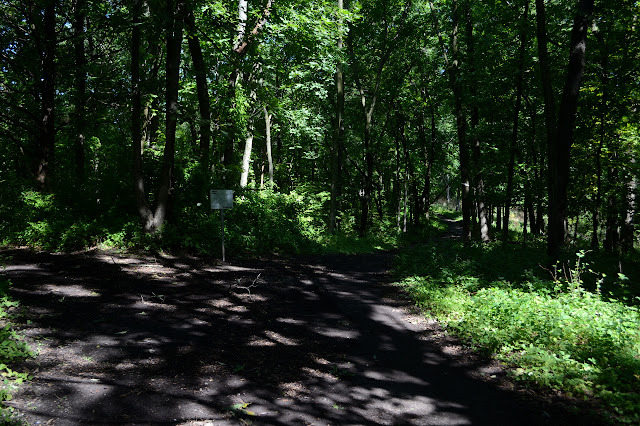 The parking is sunny, but the trail plunges quickly into shady forest. The trees are some broad leaved oaks, cottonwoods, and somewhere there are a few walnuts. The thick green hulls and a few shells lie scattered on the ground. Trail heading under shady trees. The sign with the map is off to the right. The trail soon comes to a junction and there is another sign with a full map on it. They have defeated the problem of the "you are here" dot vanishing after too many fingers have stabbed at it by simply drilling a hole through the metal. I head right to drift around the outside of the largest loop. A map sign marks the trail as it splits. My last hike for the day of a Hundred Peaks Section listed peak is out to Winston ridge. I hiked Winston Peak already one afternoon, but had not realized that I was "supposed" to continue on to the ridge beyond. They are a logical pair. Now I go for the ridge and will probably stop by the peak on the way back. First around the side. 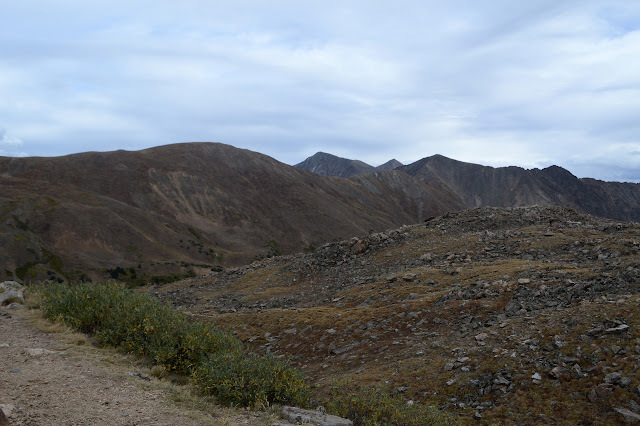 The road is a single gentle slope down to the saddle where use trails start out to the high point of the ridge beyond the saddle. 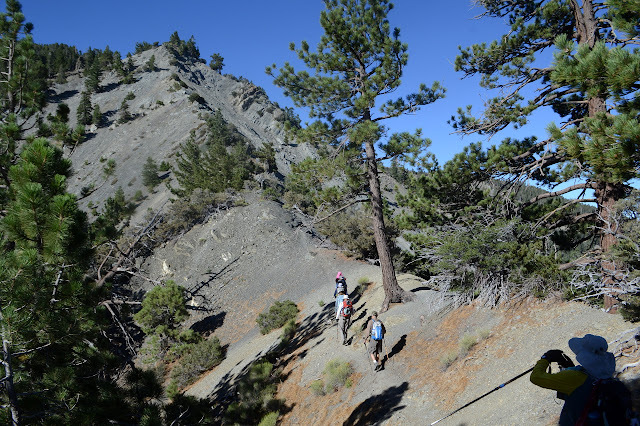 The Pacific Crest Trail winds and dips and climbs so that it is both longer and steeper. I have been on both and know this, but the thought of taking the road when the trail is available seems wrong. Besides, it should have a bit more shade in the warm day. So, with my water filled up again, I turn down the trail right of the road at the side of the turnout to wind along the trail. 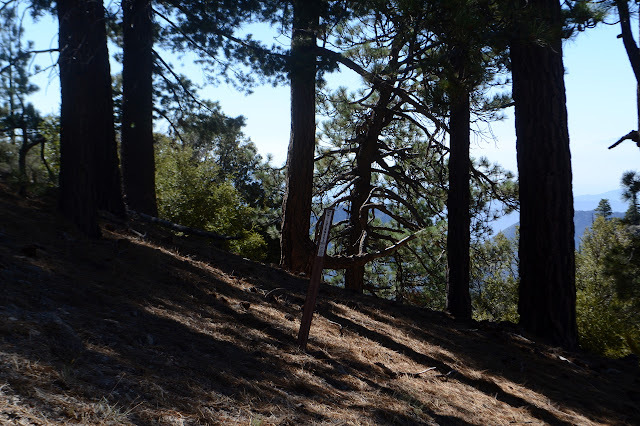 Angeles sometimes has these dinky little wilderness signs. They probably have longer lives as far as bears are concerned and are cheaper to replace if the bears take interest anyway, but I can't help but think of it as souvenir sized. Mount Akawie to the east is another very easy peak to check off the list. One little canyon seems to hold a special green that makes me think there is water in it. Nothing shows on the surface, but the line of green holds for a while before vanishing right where the trail crosses. 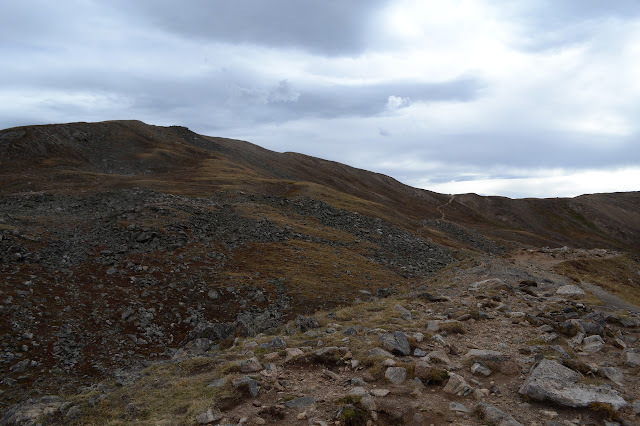 Then it climbs, at which point the trail is the only route (short of meandering cross country) to the saddle. Some PCT crests mark the trail for the crossing. 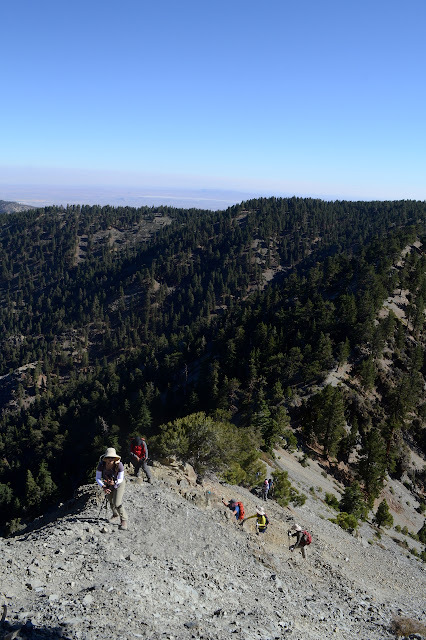 Down the canyon to Mount Williamson and Throop Peak beyond. Something about this gate makes me think this road has been very thoroughly abandoned by everyone except hikers and bicycles. Everything is almost as I remember it. The road curves off to my right to where the map claims you can find Buckhorn Spring and use trail continues up to the saddle. Bits of metal on the way hint at another bit of road existing once near the saddle where there is a short flattened area. Very strong use trail heads west from the saddle, but there is not a lot of indication of travel to the east. That way has lost its allure? 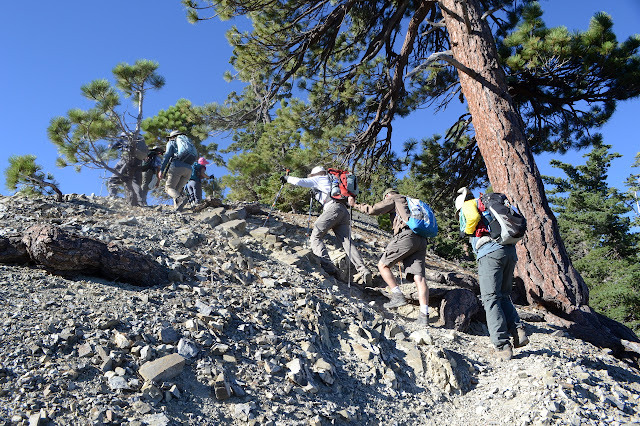 Although HPS does not use this approach, they do have a yearly Waterman Rendezvous where groups approach the peak from 3 or 4 different routes, usually including one traversing Kratka Ridge. This year it did, so some 8 or 10 people must have come down this just a month ago. Their passage is not particularly obvious now. I look very closely and decide I can almost imagine footsteps heading up the side, tending to the north where the vegetation is not so thick. Southerly toward the edge of the ridge, the trees start to have brush below them. It is a sensible enough route, so I follow it. The view from the saddle. I painted this view once. A little way up, old road becomes quite visible as it rounds the ridge northward and upward with a worn path along it. A route for me? The ridge line route still looks mildly overgrown and steep and this is meant to be an easy little hike, so I guess so. It does seem to be going my way and if it stops that, then I can just make a new way. 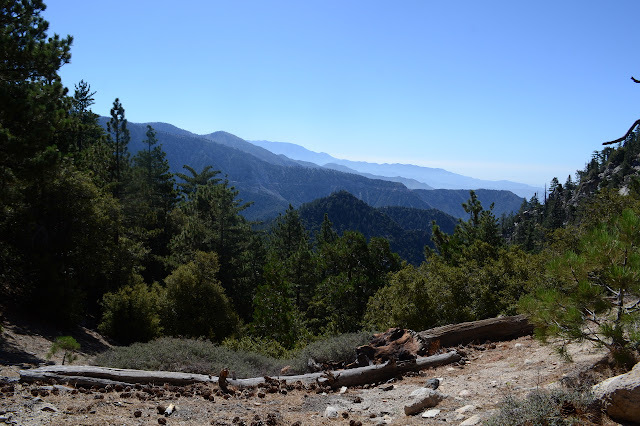 Pacing beside the edge of the San Gabriel Wilderness. The ridge is not all that brushy and would probably allow fairly easy travel. Speaking of list padding, next up is Mount Lewis. 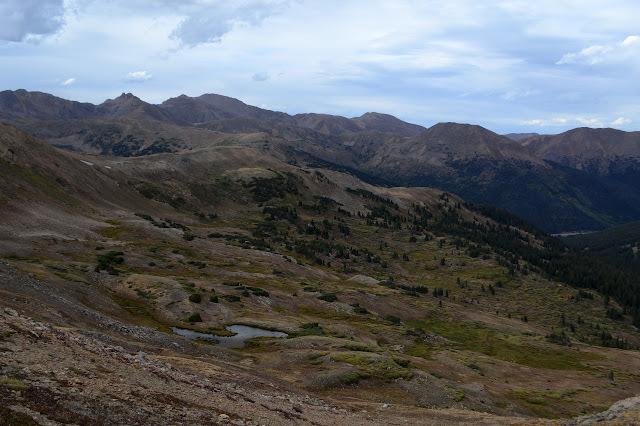 Okay, so apparently it is the high point of the Pleasant View Ridge Wilderness, but it is also a brief jaunt up from the road at Dawson Saddle. 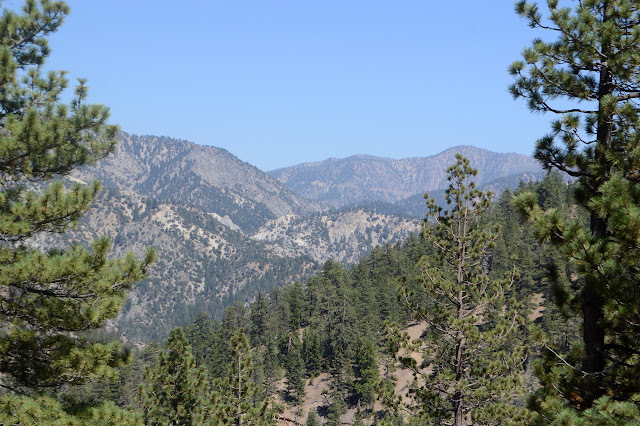 Trails from the same area climb south a bit longer and a bit higher to Throop Peak. I was up on Throop once upon a time feeling thankful I threw in an extra dinner (but that story has already been told) and not noticing the peaks to the north of it particularly. I made plans for three little hikes to grab three more Hundred Peaks Section listed peaks while I was in the neighborhood and this is the first as determined by being the next one along the road. There is a big turnout and a couple little ones to provide parking near the saddle. The only official trail is near the east end of the big turnout, but there seems to be a second trail heading south nearer to the saddle. The unofficial trail up Mount Lewis starts just west of a large shed. The trail starts next to the propane tank, of course, and climbs steeply. The trail up is well ground in and well steep. Plenty of people do this, more than just the peakbaggers keeping up with their list. Maybe it does have something going for it after all. 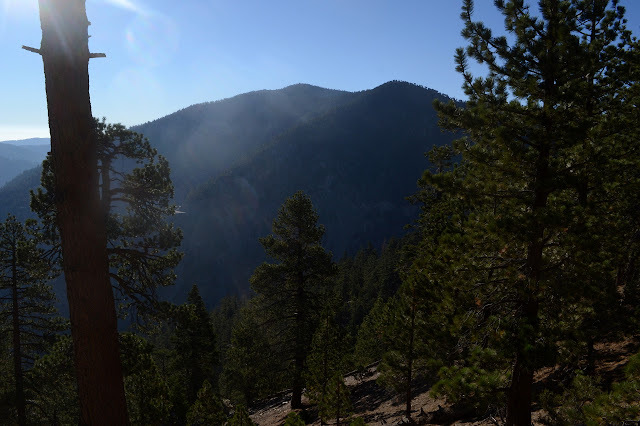 Looking into the sun at the bigger peaks to the south including Mount Baden-Powell. South to Throop Peak. We of Caltech still remember our Throop roots. In little time, I am at the top. It is not much more than a quarter mile, if even that, and the constant, determined slope mellows out once close. The biggest tree around occupies the very highest point. I thought I'd spend the night over by Vincent's place. The cabin is supposedly built by a Civil War veteran, so it has some years on it and I will certainly not be staying in it. It is a little way down the Mine Gulch Trail, one of the five trail routes and four road routes to leave Vincent Gap. It is not the hardest to find. 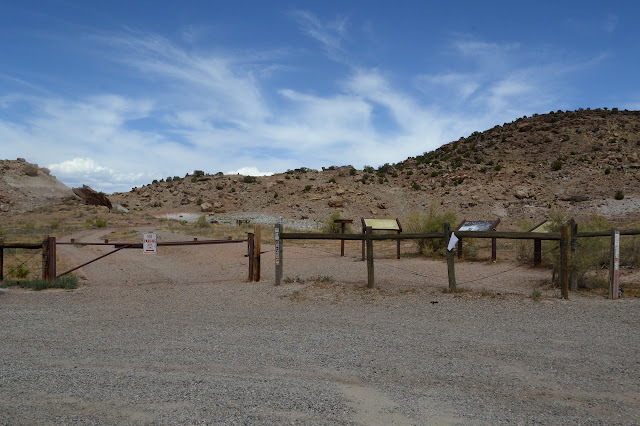 That one goes northwest and is a National Recreation Trail, so should get better treatment, but currently has not so much as a sign. 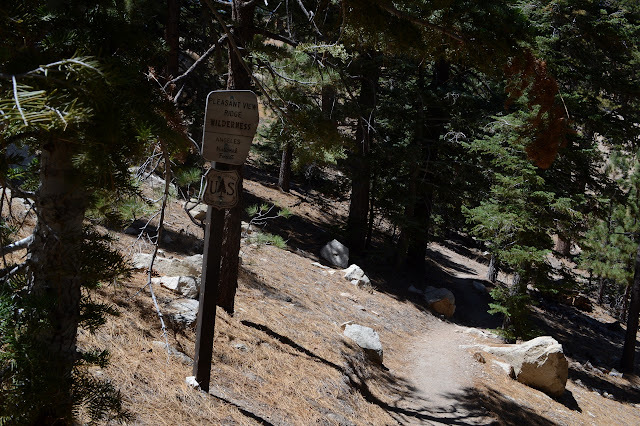 The Pacific Crest Trail wanders through from the northeast to the southwest (for the northbound direction) and gets quite a lot of traffic going up Mount Baden-Powell. I ignored that and skirted a permanently locked gate on an old road headed south. 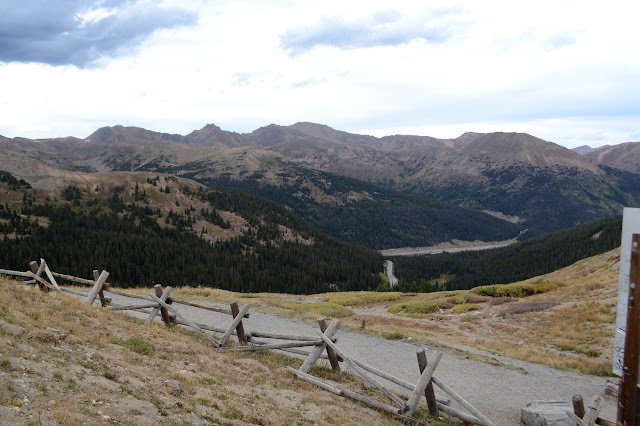 A short way down, it is signed for Big Horn Mine along road on the right and Mine Gulch along trail on the left. I hung the left. 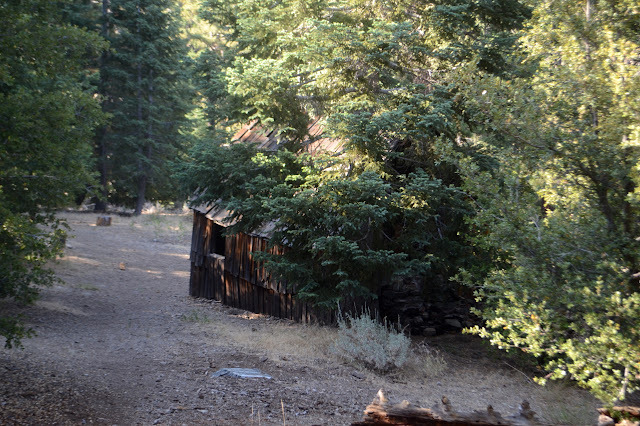 The right is quite a popular destination and I could hear people along the old wagon track above. Some nice big bumble bees along the trail. 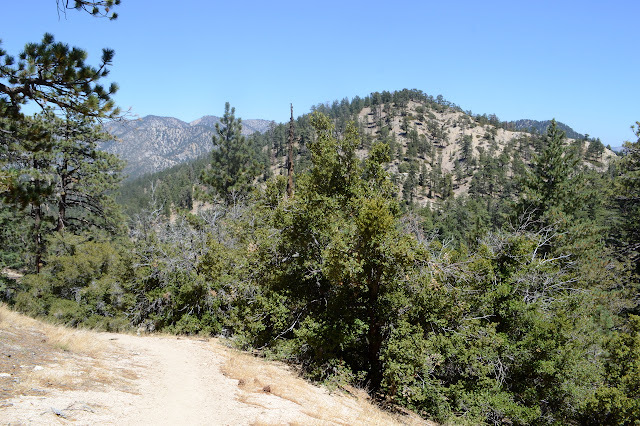 The trail goes all the way down to Heaton Flat along the San Gabriel River on the other side of the Sheep Mountain Wilderness, if one is so inclined. I turned off on a well worn path atop a fading road bed. This actually passes above the cabin. A second well worn path shortly after goes more directly to it. 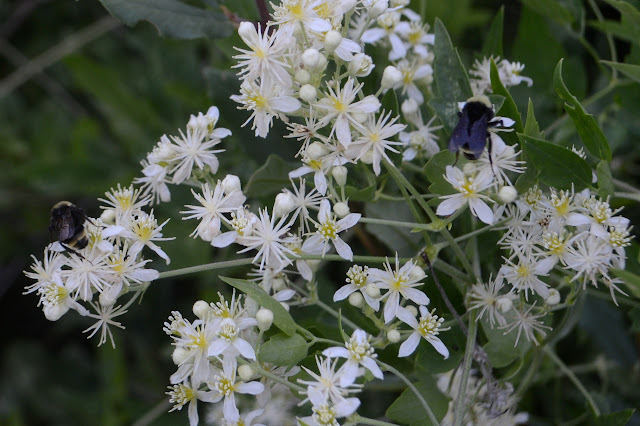 Along the way are some dark berries that look tempting and a spring with just enough water to turn the trail muddy. 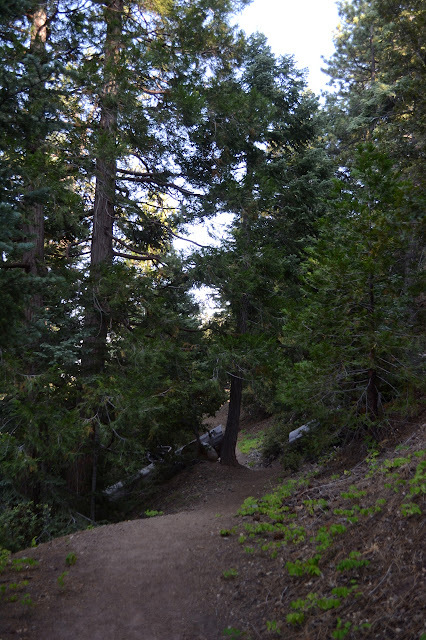 I also noted quite a few cedar trees beside the trail. 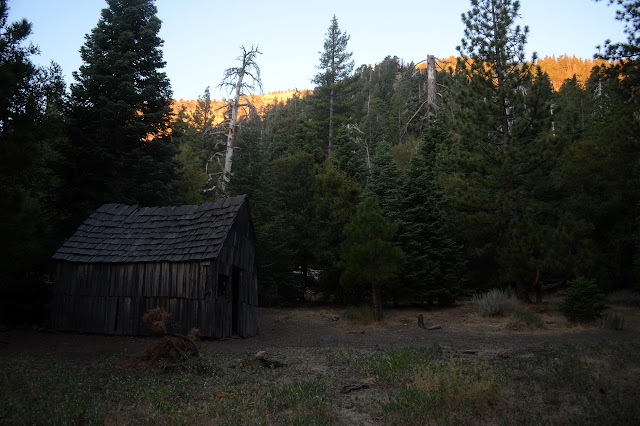 First view of the cabin following trail down from the higher road. The cabin is a curious thing. The inside seems to have many cans folks have gathered and a few beer bottles they brought. The chimney has collapsed, so the fireplace is unsafe to use. It probably would be anyway. Many of the beams seem to still have bark on them. I rather doubt anything over 100 years old would still have bark on it, but I greatly suspect folks have put quite a bit of work into preserving it over the years. I recall seeing something to the effect of a call to join a work party once. A bag of screws has been left above the door and a few can be seen in use about the place. There are other boards grey with age that are rough hewn and a little more believable. 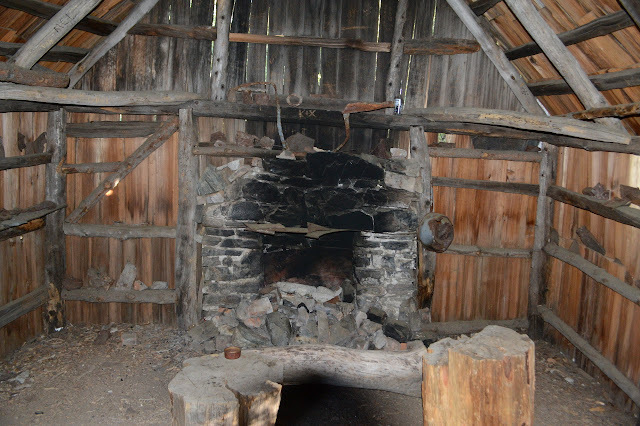 A look within Vincent's cabin. I seem to be on some sort of kick to climb a bunch more Hundred Peaks Section listed peaks. 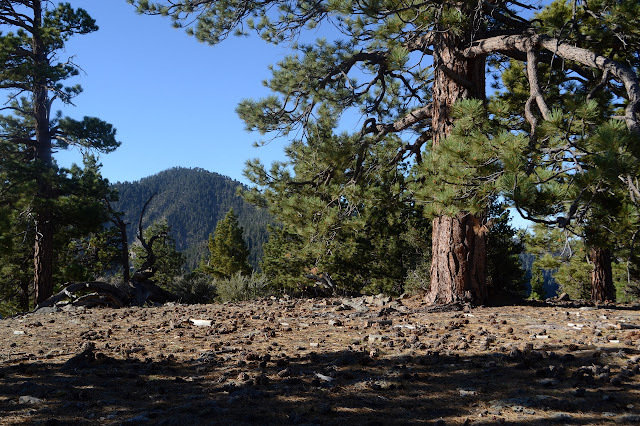 I signed up for an official outing to climb three peaks clustered north of Mount San Antonio, better known as Baldy. The section will let anyone come along, free of charge, although they do like to know something about you for the harder hikes so it is best to sign up for something easy first. This one mentions some "loose and exposed Class 2 terrain" as a reason it is "not for beginners", so probably counts as a harder hike. But they know me by now. 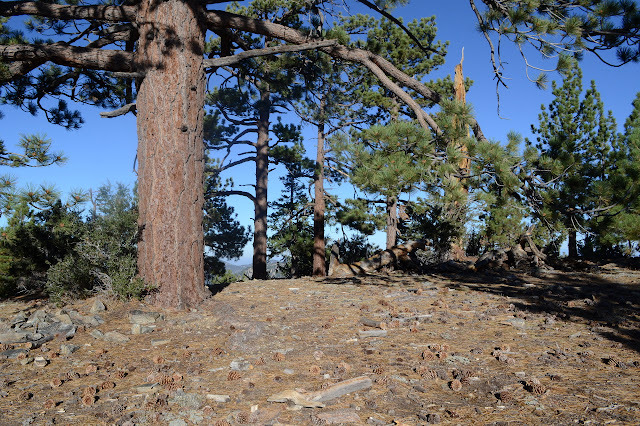 At some point years ago, I had taken note of Pine Mountain, the North Backbone Trail that crosses it, and the Blue Ridge Road and put them in the list of things I wanted to experience, so an outing doing Pine Mountain and a few others seems like a perfect way to do it. Meeting at the turn to Blue Ridge at 6:30AM to beat the heat a little is just early enough to find a parking spot before if fills with photographers trying to get pictures of the runners 9.4 miles into the Angeles Crest 100, which seems to be today. 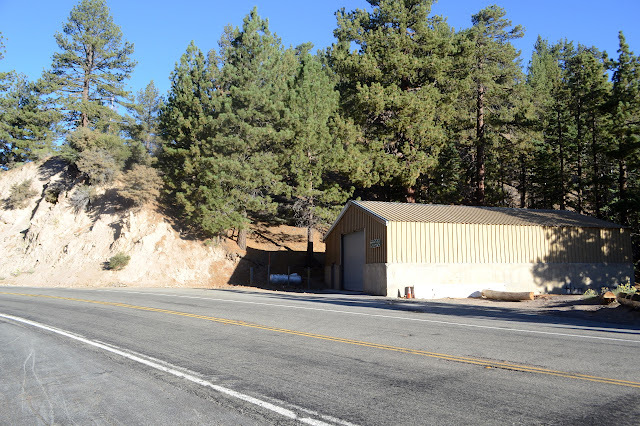 It runs 100.2 miles from Wrightwood to Pasadena along the crest. We spot the first one before heading down the road. 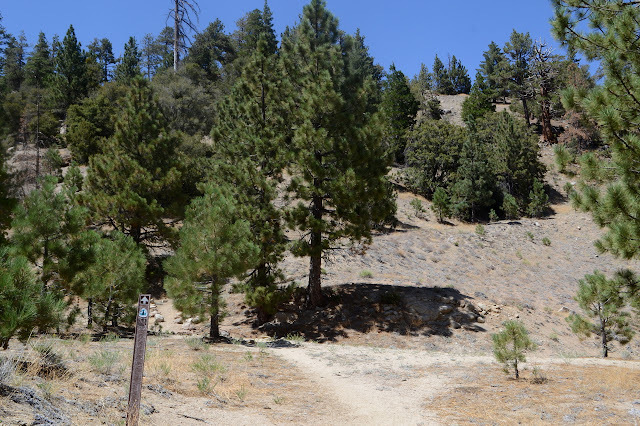 The Pacific Crest Trail, which is the race course along here, crosses the road repeatedly making the drive to the trailhead slightly challenging. 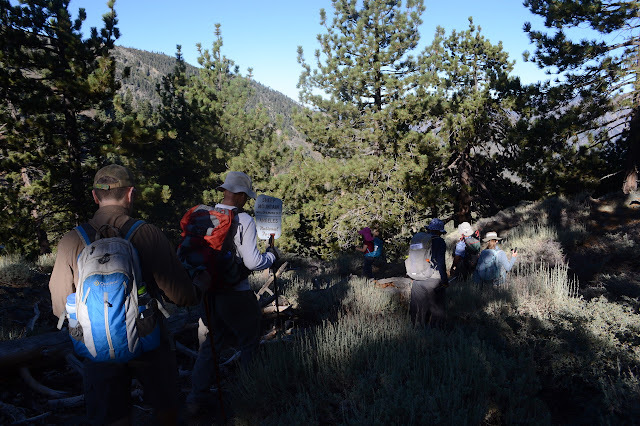 A short and steep downhill puts us into the Sheep Mountain Wilderness. Angeles administers this piece of San Bernardino. And then it is up, and we really do mean up. There are 22 total, participants and leaders, today. Kind of a lot, but it is all on trail. Well, for certain values of trail. 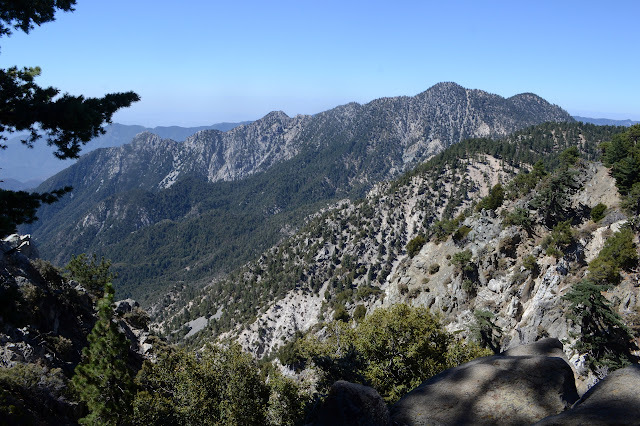 Why did I put the North Backbone Trail on the list of things to experience? 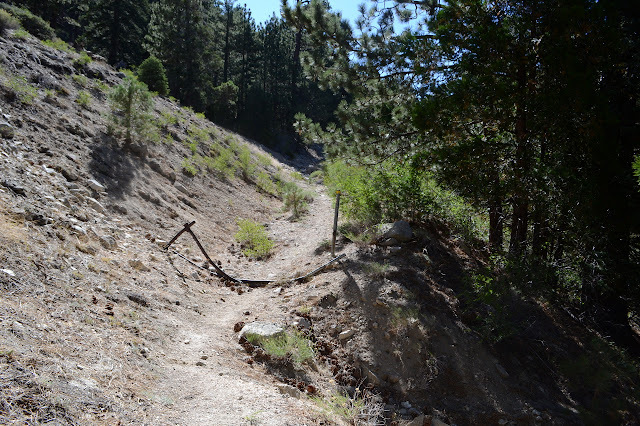 Because I hear how scary the Backbone Trail is even in summer but have not noticed it myself. The North Backbone is supposed to be more so as it follows a knife edge ridge across the tops of a couple peaks to Baldy. The ridge line is sharp, but the rocks are not quite hard enough for a real knife. The trail follows the very edge and it is dangerous enough in winter. The climbing. A spot down there did greatly encourage the use of hands to get up, which is the requirement for Class 2.